It’s January so we’re all eating healthy stuff, right? I know that if I start talking about “cleanses” or “detoxing” it brings up a lot of really strong emotions. The whole conversation can get really pretentious and conjure up ideas of juice diets or other really restrictive programs (which don’t always sound very healthy). I’m not sure if what I’m doing really falls in the same category, and I’m only talking it here because it’s worked so well for me and I want to share some of the recipes I’ve been making with you. The program is called the Whole 30, and it’s basically a strict version of paleo, where you take thirty days and eat only meats, seafood, eggs, vegetables, fruits, seeds, grains and healthy oils. That means no sweeteners of any kind, no grains, no soy, no corn, no dairy, no legumes, no alcohol… and there’s probably other stuff that I’m forgetting but that’s the main idea. I did a full month in November and I felt like a rockstar so I’m doing another one. There’s no calorie counting or restricting and I just eat when I’m hungry. I really, really like taking a full month to make my diet a top priority and form new, healthy habits. There a lots of times where I get really busy and stop planning, and this program makes me take the time to actually eat breakfast, pack myself a real lunch, and cook a real dinner with vegetables in it. Yes, we have a vegetable farm, and yes, sometimes we get insanely busy and tired and eat macaroni and cheese from a box. Isn’t that horrible and messed up? It is. Different diets suit different people, so this may not be ideal for everyone, but I feel so much better omitting grains and sugar from my diet. I’m so happy I took the time to try it out and see how it made me feel. I’ll be posting a couple of my favorite weeknight recipes during January in case other people need some inspiration. 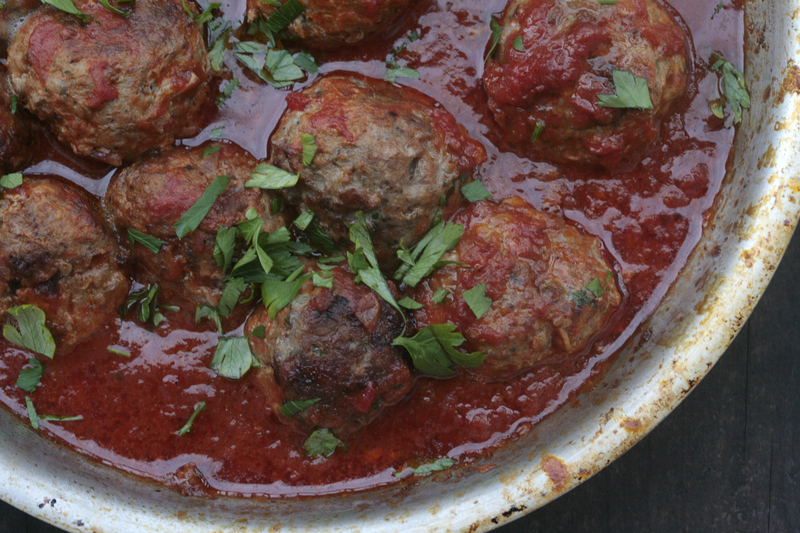 The first one I have to share are these turkey-mushroom meatballs. You can make them with spaghetti squash if you want to mimic pasta, but I actually like to eat them over a big pile of greens. It doesn’t really matter what kind; cooked greens are good, kale salad is good, collards, spinach, whatever. It all tastes good with tomato sauce and meatballs! Preheat the oven to 350 degrees. In a mixing bowl, combine the turkey, mushrooms, onions, parsley and garlic powder. Season the mixture with salt and pepper. Heat the olive oil in a large sauté pan on medium high heat. Form the mixture into balls and put then place them in the olive oil. Don’t touch them for a few minutes to let them brown. After that, gently turn the meatballs to continue browning the rest of them. Once they’re browned, pour the sauce over them and put them in the oven to cook for 20 minutes (just to make sure they’re cooked through). Serve over vegetables or with salad. Delicious as leftovers. *Just grate button mushrooms on a standard grater. You could probably put them in the food processor too. This salad. It’s so delicious and so simple, and takes just a few minutes to throw together. My brain is kind of fried from working so much, and this is the perfect kind of dish to make for that kind of time in your life. We’re emerging from this crazy whirlwind right now. In April, we moved from our house in the mountains of Lake County to a sweet little house down the road from our new farm space in Redwood Valley. Part of the transition meant turning a bunch of raw land into a vegetable and flower farm over the course of about two months so that we could grow during this season and not have to wait til next year to start. Our last farm was tiny and took us ten years to get to where it was. This farm is still very much in process, but it took us about a month to get an area planted that absolutely dwarfs anything we’ve ever had before. We’re pretty excited about everything and I can’t wait to show you some pictures. If you know me personally, you might know that I’ve been compulsively planting too many tomato starts for years and years, and that heirloom tomatoes are my one true vegetable love. I always plant more than I should but it’s really never enough. I’m so thrilled to say that I just planted the heirloom tomato garden of my dreams! (It’s HUGE). The land owner, an expert farmer who’s been teaching us a lot as we go forward this year, keeps making comments along the lines of “you are an absolute lunatic for planting that many tomatoes” but I’m soldiering on, undaunted. It’s like this song says: Only two things that money can’t buy, and that’s true love and homegrown tomatoes. Anyway though, this salad. 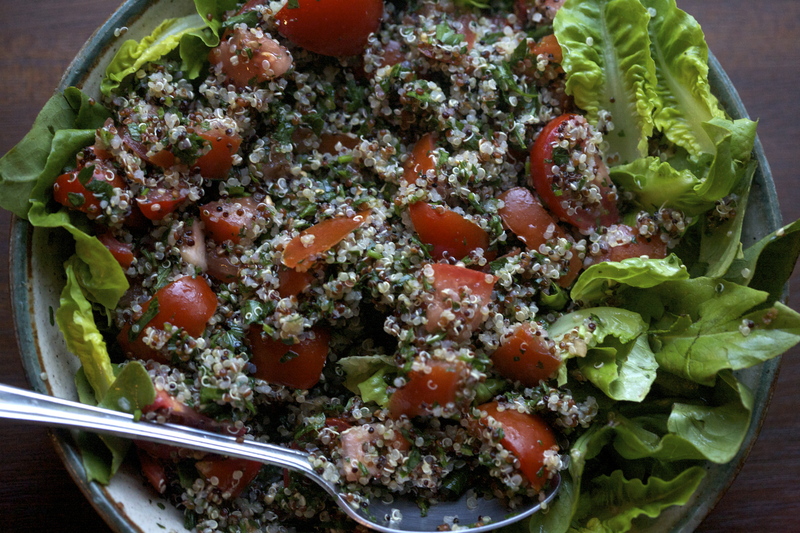 I made this tabouleh with some leftover quinoa, lettuce and herbs from the garden and some mediocre grocery store tomatoes, and it instantly became my favorite salad of the moment. It’s going to be amazing when I actually have some decent tomatoes to put in it. It’s a nice side dish for a summery dinner, served with grilled lamb or chicken, but it’s also a wonderful lunch on its own. We used butter lettuce leaves to make lettuce wraps with the tabouleh inside and it’s about my favorite thing to eat in the world now. 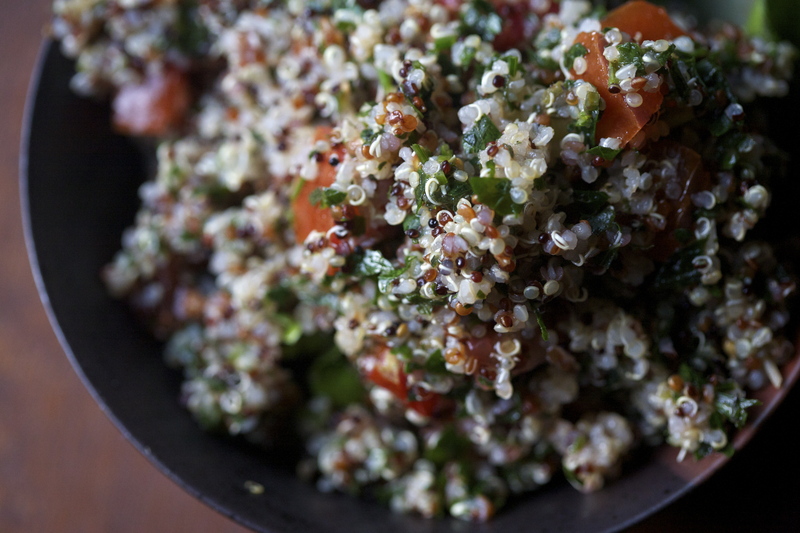 If you’re making the quinoa specifically for this recipe, rinse it with cool water after it’s cooked so that it doesn’t cook the vegetables in the salad. Leftover quinoa that’s not steaming hot anymore obviously doesn’t need rinsing. Combine all the ingredients except the lettuce in a bowl. Add the olive oil, salt and pepper to your own taste. Cover and let the mixture sit at room temperature for 30 minutes (not in the fridge! Cold tomatoes taste weird). Serve on a bed of lettuce leaves, or use the lettuce leaves as wraps.